SpaRitual believes that slowing down is the path to enlightenment and is committed to creating earth-sustaining products that relax, nourish, and reconnect mind, body, and spirit. Only in a place unconstrained by time, envy or vanity can we experience our true selves. This place where we find Slow Beauty. SpaRitual provides spa treatment products and resources to help you design and sustain a Slow Beauty practice. All SpaRitual products are packaged responsibly and are designed to complement an enhanced multi-sensory experience. This soothing cocktail penetrates the nail matrix to condition cuticles and promote healthy nail growth. Contains evening primrose oil, grapeseed and aloe oils. Scented with aromatic extracts of ginger and Fuji apple. The clean, convenient dropper cap ensures easy, precise and hygienic application. Price: R220 Size: 15ml Availability: Find stockists at 021 552 6999. 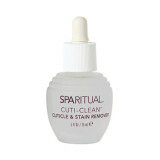 Sparitual Cuti-Clean gently softens cuticles while removing stains and dead tissue. Key Ingredients: Sesame seed oil works as a skin softener and conditioning agent. Potassium Hydroxide is an active exfoliating agent. 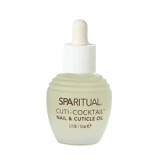 Sparitual products are also vegan and biodegradable and free of synthetic dyes, parabens & petrochemicals. Price: R220 Availability: Selected salons and spas (call 021 552 6999).